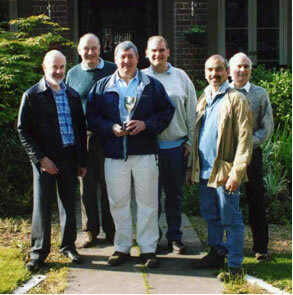 Brian Smith reports on the OF Rifle Club's second victory of the season in the Long Range Match at Bisley on 22 May. I went racing last night at Windsor and after a troubling evening managed to scoop a win and a forecast on the last race. This very nicely put £110 into my pocket for a £12.50 outlay. It’s exactly like shooting really. You’re off to an indifferent start and somehow whack in a creditable score (for me, that is to say) at the last. I didn’t make it on to the scoreboard by 0.1 of a point, that dreadful Halahan chappie just pipping me by the same amount to realise an overall 86.4. However, mustn’t grumble. Mustn’t grumble because •••..Well, read on, this is quite a story. A sunny day in May it was on the glorious 22nd. The wind was cool to cold at times, despite the sun, and blowing inconstantly. There was no doubt about it, to put in creditable scores, the wind had to be watched. But such care and attention paid off. We were up against 6 school teams. How many times the Old Lawrentians have won the long range cup I cannot count, so it was really a foregone conclusion they would fight it out between themselves and the Old Cranleighans as usual. Almost a tedious as watching Michael Schumacher win another Formula 1 Grand prix. But Framlingham had one of those heads down in a circle motivational ra ra looks about them. In fact they looked positively dangerous. 900 and 1000 yards are not easy distances to shoot over at the best of times. Nigel Burnip, who resembled a bushman on safari, was having none of that and cracked in a 50.6 at 900 just to set the pace. We ensured that little rumour was spread across the firing point, especially to the Old Lawrentians. Then we made sure they knew Andrew Horton followed up with 46.2. Gamesmanship? We love it! We drew back to 1000 yards and the wind really got tricky. Did this disturb our assembled team? I don’t think so. The Old Cranleighans sensed something was up and looked hard to their wind coaches to improve their scoring, especially V bulls. The air was riven with ratcheting as the sights were twiddled hither and thither, at one time allowing for between 5½ and 7 minutes of wind. Suddenly it was all over, the last shot was fired. Then the great moment of reckoning arrived as the cup emerging from its packing case, was held aloft, ready for presentation. Our cheers rang out across Bisley as Bullets Burnip was presented with the Long Range Cup for the first time in many years. Ours at last! But here’s the real rub. A ‘rub it in’ kind of rub. This was the second cup in succession that the Framlingham OFRC has won this year. The previous being the Q Cup. What next, we wonder? A hatrick? Andrew Horton was presented with the best shot of the day award by his father John. Brian Smith and John Horton also shot. SOF Rifle Club Win More Silverware! Good to read of John Horton & Nigel Burnip both of whom I remember well from my days at Fram. In Nigel\'s case I seem to remember many used to refer to him by his surname in reverse - \"Pinrub\". I wonder if Nigel remembers this after all these years? Keep up the good work on the ranges, where the closest I came to full bore shooting stardom was hoisting the targets in the butts! !